Build your own pizza any way you like! Choose your size and add as many toppings as you like, we'll do the rest! Cheese, Cheese, Cheese….The Cheese pizza is for all you cheese lovers. If you want toppings, then please go to our Build-A-Pizza or one of the Specials. Specialty pizza, served with Marinara Sauce, Mozzarella Cheese, Pepperoni, Bacon, Ham and Pork Sausage. 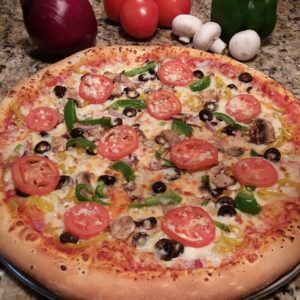 Specialty pizza, served with Marinara Sauce, Mozzarella Cheese, Canned Mushroom, Onions, Canned Green Peppers, Banana Peppers, Black Olives. Specialty pizza, served with Marinara Sauce, Mozzarella Cheese, Pepperoni, Ham, Pork Sausage, Onions, Banana Peppers, Black Olives, Canned Mushrooms, Canned Green Peppers. Specialty pizza. Olive Oil, Ricotta Cheese, Parmesan Cheese, Garlic, and Mozzarella Cheese. Your choice of two toppings. Served with a side of Ranch. Specialty pizza, served with a side of ranch. Place your next order with Sam's Mobile App Ordering. Available for Android & iOS.